Data Driven Engineering for Software Developers – Data analysis is a critical part of the build-measure-learn cycle. However, it requires different skills than software engineering. This blog empowers software developers without deep mathematical background to leverage data and build high quality software that matters. I care deeply that software engineers embrace data-driven culture, and here is why. What stops every developer from completing the build-measure-learn cycle? Why is it so hard and takes time to adjust? Because data-driven software engineering is different from classy design and coding. It is different from process we learn in college. Spending several days querying usage data and playing with it in Excel and R instead of coding – are you kidding me? This sounds like waste of time. Or isn’t it? Becoming data-driven is a big change, and change is hard. The good news is that there is a formula to drive a change. It was invented in early 1960s and got better with time, like aged cheese and wine. Most changes require effort and face resistance. To overcome resistance, we must highlight dissatisfaction with how things are now, paint vision of what is possible, and define first concreate steps towards the vision. Don’t bother with detailed plans. Details make things boring and fuel resistance. Teams will figure out details when they support the change and start applying it. Let’s go ahead and apply this formula to bring data-driven engineering to software developers. Developers can resist becoming data-driven simply because they don’t know how powerful it is and how to do it. Management can be concerned with the cost. Deep in our souls, we may fear to fail with the new definition of success. Well, these are big challenges to overcome. Dissatisfaction in the non-data-driven world comes from decision making. There are 3 popular ways to make decisions in software: intuition, usability studies, and data. Human’s intuition is awesome to brainstorm and innovate, but it is just terrible in deciding what features and designs should be implemented so they are used and loved by millions. We have different background and experience and can spend endless hours debating whos design is “better”. To prove this, pick your favorite A/B experiment and ask a team to vote on its design. For example, Bing tweaked colors on the search results page and massively increased engagement and revenue. You can learn about this and other Bing’s experiments in Seven Rules of Thumb for Web Site Experimenters. I use this example a lot to test intuition. A half of the room usually gets it wrong. An intuition driven decision about these colors would be gabling on company’s money. I think that usability studies are great. We should continue running them to learn what experiments to run next. However, these studies tend be biased because most companies cannot invite all their customers to a usability lab. These studies suffer from the measurement effect because people behave differently when they know that others are watching them. A few years ago, Bing experimented with a gray page background. Customers loved this new modern look at usability studies. However, user engagement and revenue dropped sharply in the A/B experiment that tried the gray background. It was shut down as a live site incident. Guess what, Bing’s background is still white. It may feel awkward to bring up A/B experiments every time a non-data-driven decision is made. An alternative is to ask questions about feature usage, entry points, and success criteria when team’s priorities are discussed. Create a culture that empowers and encourages every team member to ask these questions. Vision is the easiest part of the formula. I cannot imagine a self-respectful team that doesn’t want to justify its existence by measuring its business impact. A team that doesn’t want to invest precious time to improve most popular features and to fix most damaging bugs. First steps tend to be a challenge. Many pieces have to come together before you can benefit from data-driven decisions. Start with infrastructure that enables easy instrumentation and data access. It can take months to build a data pipeline from the ground up. Don’t do this. Instead, shop around for a telemetry solution that works well for your platform. Telemetry data is boring. Insights are interesting and unique, but the data is just a set of events with properties such as a timestamp and a user ID. Borrow and reuse as much as possible. It should take hours, not months, to get the data flowing. Instrumentation and query are the only parts of the data pipeline that are unique to your application. This is the only code you should be required to write. Next, you will need to define metrics to track and optimize. Start with counting users, clicks, and errors. Measure time to success and a success rate. Put these metrics on a dashboard and bring them up at standups and team meetings. The team will soon develop instincts when data looks normal and when it is time to investigate. Later, you can automate this process with alerts. Add properties specific to your domain to debug data with funnels and segments. Leverage data to justify building or cutting features, fixing usability issues, and optimizing reliability and performance. I would love to hear your stories – what worked and what didn’t? Please share them in comments or send them to me, whatever works best for you. Let’s take a look at the classic Build-Measure-Learn cycle. How many people should be required in order to complete one iteration? Most successful developers I worked with were able to build a feature, collect telemetry data for it, analyze the data, tweak the feature accordingly and continue to the next iteration. People who can do this are unstoppable in building software that matters because they can iterate and learn very quickly. In many cases, completing the Build-Measure-Learn cycle requires just a small set of skills in addition to coding. These skills can be learned in a matter of weeks and at the job. They do not require deep statistical background. Of course, there will be cases when data does not make sense or when complex data modeling is required. That’s the time to engage with a data scientist if your team is lucky to have one. What does it take to enable every developer to complete the Build-Measure-Learn cycle? The “Build” part is given. Democratizing the “Measure” part requires a simple and robust data infrastructure. It should take one line of code to send an event when something interesting happened and one line of code to query the number of such events from a data store. If your team does not have a data infrastructure yet, it’s usually easier to leverage existing one instead of building your own. Shop around, there are a few good available. Some of them even hook into standard systems events like web requests so you do not need to write instrumentation code at all. And please do not build yet another dashboard just to show your telemetry data. It’s traditional to think that the “Learn” part requires a trained data scientist or a market specialist. Sometimes this is true but in many cases it does not. Before starting on Bing performance I was a developer who spent most time writing code, debugging issues and analyzing error logs. In other words, dealing with one data point at a time. Back then I did not consider Excel or R as a part of my toolbox. Developers are really good in dealing with one data point at a time. Here are specific things they can do to learn about their software from data. Spend a day or two to figure out how to connect Excel to telemetry data source and play with the data in a Pivot table. Start by plotting a daily trend of the number of users for your feature. Does it match expectations? Do weekends get higher or lower usage? Now take several weeks of data. Does the number of users trend up or down? If the overall usage is low, test all entry points for the feature and think how a list of entry points can be expanded. Next, pick a metric that impacts user experience and you have direct control over. It may be a number of errors per user per day or 75th percentile of the application start time. Plot a daily trend. Does it match your expectations? Does it trend to the right direction? To improve the metric, think about a dimension that can impact the metric and “segment” by it. I wrote about funnels and segmentation in 3 Ingredients to Start Data-Driven Engineering Smooth and Easy. This will make the data actionable and allow you to change code and improve the metric. Build-Measure-Learn cycle must be fast in order to stay competitive. I encourage software developers to complete it without external help as frequently as possible. Software engineering teams have been working with data for decades. It is data in apps and services they build. 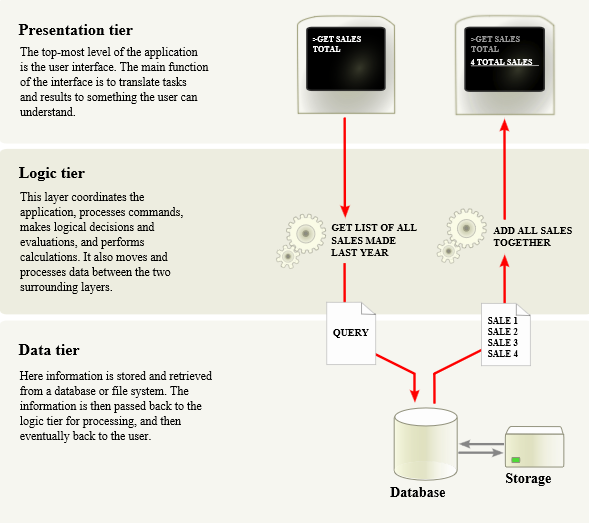 There is a well-known multitier architecture for data-driven applications. This is cool because it allows us to tune data schema for a specific domain, implement complex business logic and build slick user interface that will stand out among competition. However the same approach applied to telemetry often leads to duplication and wasted effort. A shape of telemetry data does not change much from one app to another even across companies and industries. It aims to answer similar questions like how many times a feature is used, by how many users, how fast it is and if there are errors. Borrowing and reusing is the key to build a robust telemetry system. Please do not write code to create yet another dashboard that shows telemetry data only for your application. It’s usually cheaper and more flexible to connect an existing data visualization solution like Excel directly to the data source. While application data captures the current state of the world, telemetry data stores rich history of user interactions and application behavior. Expect telemetry data to be orders of magnitude larger than application data. Apps with small usage may get away with a standalone database for telemetry. Ambitious teams who expect rapid growth should plan for a big data storage that supports MapReduce to process terabytes of data in minutes. An architecture of a telemetry system can be greatly simplified. The only custom code that should be required are queries to formulate business questions. This approach can save weeks of engineering effort. Enjoy this time to make your app or service even better! Last time we discussed how data-driven engineering becomes a key skill for software developers. Here is an approach to data-driven engineering that does not require deep math skills. Consider a hypothetical startup that just launched a web site that has a landing page, a sign up page and a welcome page after sign up. This is a new product so growing the number of signed up users is the top priority. Unfortunately only few users has signed up so far. Can we do something better than just assuming that the startup idea is not appealing? Yes we can. The first step is to record an event when each page is displayed to a user. There are several commercial and open-source solutions available to instrument and store this data. Writing a row to a database from the page rendering code might be good enough to get started. The goal is to create a table that has a page name, a timestamp and a user ID. There are many clever ways to uniquely identify users. Storing a GUID as a cookie works in most cases. Marketing funnel is a well-known technique to drive users from prospects to clients. The idea is to identify an entry stage, a desired stage and stages between them. The number of users dropping at each stage can be measured to focus marketing resources on a problematic stage. The same technique can be applied to users navigating web pages. This can be done by filtering the timestamp to the time period of interest, grouping by the page name and finding a distinct count of users. The result shows the number of unique users per page. The lowest percent of users going to the next page indicates the focus area. It appears that 90% of users who saw the landing page clicked the sign up button. Not bad for a startup. This hints that customers are interested in the product. However only 10% of users who got to the sign up page were able to sign up successfully. Something must be wrong with the sign up page but this high level picture is not actionable. Analyzing data user by user is too expensive and not necessarily actionable as well. We need to find something between these two extremes. The goal is to narrow a problem by finding a subset of users (aka segment) who have challenges signing up. Let’s apply creativity and domain knowledge to brainstorm segments that can impact ability to sign up. Here are some examples: a user age, a country, a day of the week and a browser type. The segments should be prioritized by their potential impact and ability to get data for them. For example, people tend not to share age online so the age segment goes to the bottom of the list. A browser type can be retrieved from a user agent string. This is easy enough to get started. So far the telemetry table has a page name, a timestamp and a user ID. Let’s add the browser column for each page view, filter by users who got to the sign up page or the welcome page and group by the browser type and the page name. This aha moment is called an insight. It’s now possible to debug the sign up page in Firefox to pinpoint and fix a browser-specific issue. Caution: real life examples will not be so black and white. Difference in values for a segment can be caused by noise in data. For example we may have only one Firefox user who decided not to sign up. Math has been developed to calculate so called statistical significance to measure a chance of the delta for a segment be a result of noise. Learn and use this math or just investigate largest segments that are most different from other segments. There must be another issue in this example because percentage of users who were able to sign up even for IE and Chrome is still quite low. Let’s use the same technique to segment telemetry data by a day of the week. And this data shows us (drum-roll…) nothing. The ability to sign up does not depend on the day of the week. It’s OK. It’s common to try several empty theories before finding an insight. Do not give up when this happens. Continue brainstorming segments and involve new people with domain knowledge when running out of ideas. Next let’s segment telemetry data by country. It will be a bit more work because it requires to reverse geocode a client IP address. This segment brings an interesting insight. Users outside of USA have very low sign up rates. It is not a language issue because Great Britain also speaks English. Looking at this data side-by-side with the sign up page hints that the required State field allows to only pick from 50 USA states. Additional check on users who did sign up from Great Britain and China show that most of them have picked the Alabama state that is the first one in the list. The sign up page should be redesigned to support customers from all countries. Instrumentation and funnels are straightforward software development work. Segmentation is an art. It requires domain knowledge and creativity to come up with a prioritized list of segments and then code knowledge to debug interesting segments. This technique can be applied to any web site or an application that has a flow of user actions. It is a good way to start on data-driven engineering without spending a lot of time learning math upfront. Data Driven Engineering: Why Should I Care? Remember these old days when software engineering teams used to tune software until it passes quality gates, give golden bits to marketing and throw a big release party? The world was nice and simple and writing code that works according to a specification was enough to be a star developer. Things have changed now. A lot of code has moved to services that are always connected. Even apps usually dial back home to record telemetry about their usage and health. This data flows back to engineering teams who became accountable for making sense out of this data. Engineering teams now share responsibility for driving business metrics such as revenue and engagement. Some people call it data-driven engineering. I think about it as a fundamental shift in a role of software engineer. Teams who can leverage data-driven engineering will delight customers by learning about them more than customers know about themselves. Teams who ignore data-driven engineering will continue based on assumptions and will eventually lose competitive nerve. Telemetry data is not a bug report with a local repro or a trace. It will take forever to analyze it user by user to find patters in any sizable application. Software engineers need new skills to analyze telemetry data at scale and make changes in code that will drive desired changes in user behavior and software health. Wow, it looks like a different job now. Most of us learned basics of math at school. Some of us may have taken a statistics class in college. However, until recently, a data analyst and a software engineer were two distinct professions. Many of us did not have a chance to practice math and stats while writing code and going to ship parties. Well maybe it’s time to blow dust off that old math book. Unfortunately the entry barrier is quite high. The same way we are comfortable with design patterns, popular libraries and profilers, data analysts are fluent with things like population, types of sampling, p-values, decision trees and so on. It may take months to learn it deep enough to apply for your projects. I was lucky to study applied math and computer science in college, forget math during the first 8 years of my career and then relearn it to be a part of data-driven engineering in Bing and Visual Studio. This blog will make it easier for software developers to join the world of data-driven engineering. It is not about pure data science as this topic is covered well elsewhere. Instead I will focus on a practical approach that sometimes deviates from classical data science but is easy to learn and apply.